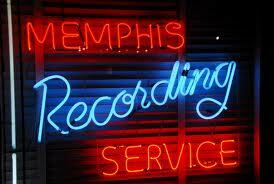 If I am right, the Memphis Recording Service is a record label based in Europe. During the last decade, when ‘Elvis The Concert’ has visited UK stadia, its publicity leaflets have appeared on the seats. I hope it is European because it would make sense. Everything about the label proclaims an obsessive desire for resolution, an insistence upon the ultimate truth. Such obsessions usually take root at a remote distance. For my generation, Elvis was the ultimate musical mystery, a performer of incomprehensible contradictions. He was someone who not only used his talent to anoint himself with glory but a man who was reduced by a cynical abuse of his powers. Elvis was somehow a sweet altar boy and a callous vampire. And if that is not mystery enough, nobody can really say which came first or which finally prevailed, the pasty blood sucker or the pious innocent. Perhaps it is always the same consequence for self-destruction, the path travelled leads to nowhere for the self. booklet which tells us everything we need to know about the context in which Elvis had to perform. The extra material does not dwarf the concert on the CD but only because Elvis is fabulous. He was not always so brilliant. In some years he declined or relaxed or did both. This package with its press clippings, the preview radio broadcast and photographs that even include the bombing of Pearl Harbour confirms how others were always ready to redefine Elvis whenever he slipped. The preview radio broadcast constitutes 7 bonus tracks on the CD. They are tracks taken from his gospel recordings and are all fine records. But the context is everything and the radio show reveals the crass vision of Parker and his determination to create the American conformist acceptable to everyone. The music that announces this preview radio show is a self-important treacly mix of Mantovani and military patriotism. It has nothing in common with the heartfelt humility of Elvis’ gospel music. The announcer without any hint of credibility tells the audience that Parker has paid for the broadcast. The cynical conservative version is understandable. What baffles is how Parker thought it was appropriate for Elvis. Surely he would have been embarrassed when Elvis appeared on stage in the gold lamé jacket to contradict the carefully planned apple pie publicity. Apart from the carnage of Pearl harbour, the 100 page booklet has plenty of decent photographs of Elvis. One shows Elvis sitting on the side of the stage with Parker at the side watching. 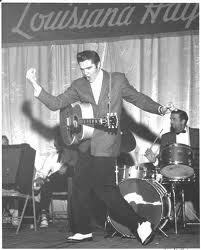 Elvis looks like a free spirit let loose, someone who will be impossible to restrict. Of course, it is merely a photograph of a man in a triumphant moment. Parker is sinister and a man with designs but he is not impressive because he appears unable to comprehend. And yet, Parker prevailed, not Elvis. Some argue that Elvis was neither great nor complex. It is tempting because it dissipates the troubling mystery. He was a singer and nothing more, they argue. But this is nonsense. We only have to look at a couple of photographs that show Elvis holding the microphone with one hand and pointing at the sky with the other. I am not sure what Elvis means but the image has existential consequence. This is only a photograph. The real revelation is the CD and the concert. In 1961, Elvis had the voice that seduced so many of us. Later, in Vegas, he had a talent that persuaded many, including me, to stay loyal. If both are admirable in different ways, it is the former that truly conquers. The difference is evident on his performance of ‘All Shook Up’. In Vegas, the song is a light rocker that might just persuade us to tap our toes. This earlier version cracks like a whip, especially in the chorus when he sings the words ‘a love so fine’. The Parker designed context may reduce his consequence and tarnish his image but, here, the talent of Elvis is uncompromised. In an odd way, it is not difficult to compare this powerful Elvis with the later Vegas performer. Both shows mix rockers and blues with ballads and gospel numbers. He also combines his music and aggression with teasing and showmanship which he probably always did. So, in his defence, the later shows do not represent the betrayal of his integrity that many claim. The same man is still up there on stage making judgements that are quite similar. But, in 1961, his exceptional powers gave him an edge. The early shows were rehearsed and perhaps prepared with the same calculation. Elvis did not deviate from the song list that he planned. And yet, there is a voice that is intimidated by nothing and this puts him and us in a special place. It is elevating. It would be wrong to say that in the later shows this never occurs but, when it occurs, it feels accidental. When he is on form and when he is confident about the nature of his triumph his transcendence feels natural and inevitable. There is the promise of permanence. 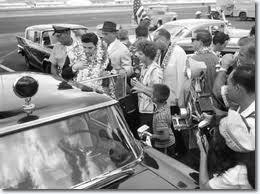 Elvis is uninhibited and intimate with his audience in a way that he rarely achieved in Las Vegas. He not only sings ‘Reconsider Baby’ but begins it with a roar of approval that makes his passions clear to everyone. He could simply be more enthusiastic but the listener is persuaded that his confidence is leading him to where he can exist at his triumphant best, his real but denied destiny, the audacious exaltation so many of us found irresistible. Elvis has been criticised for stealing black music. The critics argue that this makes him second rate but here his versions of the blues numbers make comparisons with the originals irrelevant. What we have is personal experience being redefined by a fearless revolutionary. Admittedly, it calms down before the end of the show and the wild creature rests and is settled by the sweet lyricism of ‘Are You Lonesome Tonight’ and ‘It’s Now Or Never’ but the wildness will be the insistent memory. In case anybody forgets, Elvis finishes with a very tough ‘Hound Dog’. 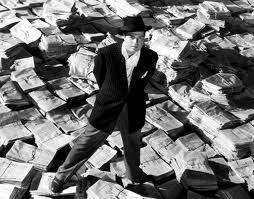 Orson Welles was asked to explain why he never matched the brilliance of his cinematic masterpiece, ‘Citizen Kane’. He said it was difficult because, after such a triumph, you were obliged to only compete with yourself. After the show in 1961, Elvis did not appear on stage for another 8 years. The Elvis that emerged from retreat was often self-mocking and remote, sometimes insulated by drugs. Many of those curious about why he was subsequently defensive failed to understand the fears that that made the older man inhibited. The best explanation is found within Elvis and his own earlier brilliance. ‘Such A Night’ reminds us again of why he once frightened so many people. We should not be surprised if it often unnerves those with the actual talent. If you want to read what the author says about Frankenstein click here. If you want to read about what happened when the author visited Brazil click here. If you want to listen to the CD, Such a Night, click here. What an interesting read! I have heard a variety of people speak of Elvis, the great man with the amazing songs, but also the unfortunate shell of himself towards the end of his wonderful life. What a well written article about the year of 1961, and a good accompaniment of photographs too. Another interesting piece brimming with detail and a range of factual information which is well supported with Howard’s usual analytical approach.